That was the subject line. 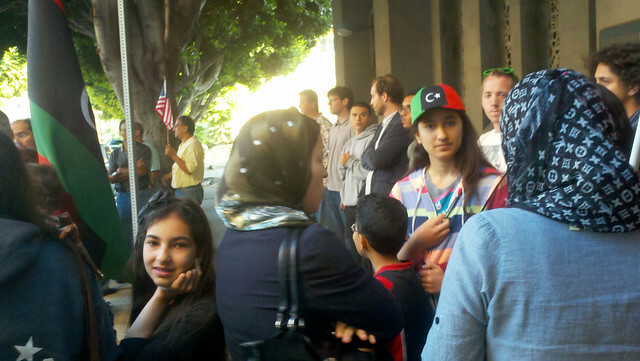 The body was simply a link to Thursday's LA Times article on Libya. Here is a link to the Shabab Libya reprint. My response to John Hankey is as follows: Funny how you anti-interventions are so quick to cite the Main Stream Media uncritically to condemn the Libyan Revolution. If it really was a Western-backed coup, I should think they would be singing its praises now, instead we find that you and they are on the same side of the Libyan Revolution. That is why I call you anti-interventionists turned counter-revolutionaries. Below the fold we will turn our attention to the hatchet job that passes for journalist at the LA Times when it comes to Libya. The article is titled "Libya now ruled by the law of retribution" but this is immediately contradicted by the photo of Saif Qaddafi in detention below the title because if Libya were truly ruled by the law of retribution, that man would not still be alive. Although the electricity is still on in Libya, the schools are back in session, people are getting back to work and oil production is now approaching pre-war levels, the focus of this article is what the LA Times considers the unduly harsh treatment of members and supporters of the Qaddafi regime. History has shown that it is not enough for a revolutionary people to overthrow the old regime. If they are to consolidate the victory and be able to build on the freedom they have won with their blood, they must for a while, exercise a dictatorship over elements of the old regime. the interim government is caught between the reality of having to engage with former Kadafi regime workers, who are highly trained and experienced in the machinations of governance, and its promises to hold to account those with blood on their hands. Retribution is the new law of the land in Libya. Summary executions, arbitrary arrests, torture and indefinite detention have emerged while the judicial system remains in a state of paralysis. The result, rights groups charge, is an environment of impunity. In a country whose revolution's defining moment was arguably the apparent execution in October of Kadafi in captivity — a possible war crime that remains unpunished — dangerous precedents have been set. I find it characteristic of this lot, that of all the atrocities commented in Libya, most at the behest of Mummar Qaddafi, it is his possible murder that they want to see punished first. The issue is whether the law will be applied equally for pro- and anti-Kadafi factions. Yes, that is the issue, because if the "anti-Qaddafi factions" i.e. the masses of people that organized themselves and shed much blood to overthrow a 42 year dictatorship, and the "pro-Qaddafi factions", i.e. the forces of the old regime, are treated equally under the law, that is all they need to restore their power. Besides, whenever does that happen after a war? The pro- and anti-Kadafi factions, to use the LA Times happy terminology, just fought a viscous war that cost 30,000 lives and was imposed upon them by the pro-Qaddafi faction. Immediately after our own Civil War, were Northerners and Southerners treated the same under the law or were Federal troops sent down to Dixie to impose a dictatorship? The governments of Ukraine, Russia and Belarus are to appeal the conviction of 24 of their nationals imprisoned for providing military assistance to the Qaddafi regime during last year’s revolution. On Monday, the men were found guilty of a number of offences, including the setting-up surface-to-air missile platforms to target NATO aircraft. 19 Ukrainians were sentence to ten years hard labour, along with three Belarusians and a Russian. A second Russian national, said to be the coordinator of the group, was given life imprisonment. “We respect the Libyan court, but we do not agree with the verdict”, said Oleg Nikolenko, First Secretary at the Ukrainian Embassy in Tripoli. “We do not believe the men are guilty. We want the decision to be reviewed and for the Libyan court to make another decision. We will appeal the verdict." TRIPOLI (Reuters) – The first trial of a senior Muammar Gaddafi-era official accused of crimes relating to last year’s war opened on Tuesday, in what will be seen as a test of the Libyan government’s ability to try high profile loyalists and family members of the ousted leader. Under heavy security, Buzeid Dorda, a former intelligence chief arrested last September in Tripoli, appeared in the dock in the first such civilian hearing since last year’s uprising. Judge Al-Ajaily Al-Maaloul read six charges against him – conspiring to kill civilians, providing weapons for the purpose of killing civilians, conspiring to provoke civil war, denying people their right to protest, unlawful detention and abuse of authority. “I deny all these points. I will supply the evidence when I testify in court,” Dorda said. However you look upon these proceedings, whether you agree with the verdicts or even the ordering of the trials, it is somewhat disingenuous to say "the judicial system remains in a state of paralysis" as the LA Times does without telling the reader any of this. Of course, from the POV of the MSM and the anti-interventionists turned counter-revolutionary, a proper judicial system would have made trying Mummar Qaddafi's alleged murders their first priority. The position of Kadafi's onetime heir-apparent, son Seif Islam, underscores the problem. The International Criminal Court wants him transferred and tried in The Hague. The interim government insists on a trial in Libya but remains unable to extricate him from detention in the former rebel stronghold of Zintan, whose officials want him tried in that city. Meanwhile, Seif Islam Kadafi and 8,000 other detainees held without judicial review remain in a state of limbo, guilty until proved innocent. Martin said he believes the Libyan government is committed to ensuring access to justice for its citizens but "serious obstacles are hampering this process." The transfer of prisons to the Ministry of Justice is progressing very slowly, with just 31 facilities and 3,000 detainees now under its control, Martin said. "An additional number of detainees, perhaps around 4,000, are still in the custody of brigades, either at formal or secret detention facilities," he said. Martin said "cases of mistreatment and torture of detainees continue," citing the deaths of three people at a detention center in Misrata on April 13. The US is backing Libya in its dispute with the International Criminal Court as Tripoli and The Hague wrestle over jurisdiction to try Saif al-Islam Gaddafi, the son of the former dictator. "Our preference is to try cases in the national system if you can have a process there that meets minimal standards of fair justice. The Libyan government says they can do that," said Rapp. "We certainly would like to see the Libyans provide a fair and appropriate justice at the national level. It won't be the same thing that happens in The Hague but The Hague is only for a relative handful of cases and the international system we see developing is one where countries do these cases themselves with international assistance, sometimes with international participation." The new administration in Tripoli argues that Gaddafi should be tried at the scene of his crimes, Libya. The ICC last week dropped its demand that he be immediately handed over and said that he can remain in Libya while the court decides who has first claim. I would also point out that Saif Qaddafi is being held by the Zintan Brigade with the agreement of the NTC. When the Zintan Bridage turned over the Tripoli Airport to the NTC, they stated publicly that they would turn Saif Qaddafi over to the NTC on demand. When another brigade briefly took over the Tripoli Airport last week, it was the Zintan Brigade that got it back and turned it right over to the NTC again, so there is no reason to disbelieve their promises with regards to Saif Qaddafi. Just some stuff the LA Times article failed to mention on this topic that I thought you should know about. Yesterday’s official weekly government press conference was dominated by the attack on Tripoli International Airport and the attack on the US consulate in Benghazi. Although official spokesperson for the Prime Minister, Nasser Al-Mana , did his best to try and distract the general public away from the two biggest events of the week by making the media sit through nearly an hour of routine news before making his way to these attacks. Al-Mana said that ‘government institutions had no knowledge of the whereabouts of the missing person’, the Tarhuna military commander Abu-Ajilah Habshi, who was kidnapped by unknowns on Tripoli Airport road last Sunday. This was given as the reason by the Tarhuna militias for their attack on Tripoli Airport. Nevertheless, he ‘condemned the kidnapping of anyone’ and he equally condemned ‘any attack on any public institution for any reason’. The spokesperson revealed that the government had given orders to the Interior Ministry and the Army to use force against anyone who attacks government institutions. He confirmed that the airport was reclaimed within hours and that arrests were made and vehicles were held. He pointed out that both Tarhuna Military and Local Councils had distanced themselves from this brigade from Tarhuna. A committee had been formed to investigate the incident. Investigations were continuing. When challenged by journalists as to how such a relatively small group of militias were able to occupy Tripoli airport, and how they were not spotted en route to the airport, the spokesperson admitted that ‘mistakes were made’ and that the government ‘should learn from these mistakes’. The spokesperson had nothing new to add to the incident of the attack on the US consulate building in Benghazi. He confirmed it was some kind of homemade device and that it had hit the outside wall of the consulate causing little damage. He had no evidence of the people behind the attack. He said investigations were continuing. The spokesperson announced that the Ministry of Justice reported that the second batch of members of the Justice Police had graduated. These are the official security personnel responsible for security at Libya’s prisons and courts. He also pointed out the regular media reports of an increasing number of prisons being handed over to the government by militias. He admitted, however, that because of ‘exceptional circumstances‘ quite a few state prisons or prisoners were still being secured by militias. He felt that the circumstances were now quickly changing as the state was slowly re-establishing itself and taking more and more control with each passing day. Al-Mana also reviewed the two prominent court cases of the week of Qaddafi’s last foreign intelligence head, Abu Zaid Dorda, and the appeal against Law 37, which bans the glorification of Qaddafi and his ideas. The spokesperson was eager to highlighting the fact that Libya’s court system was now operational and stressed that Libya was now a state of the law. Al-Mana warned the media and the general public against the media war being conducted by the enemies of the new Libya. He warned against false facts and allegations such as the claim that Saif Al-Islam Qaddafi had escaped to a neighbouring country. The spokesperson warned that the more stable and secure Libya became, the more effort its enemies made in an attempt to de-stabilize it. THE CLAIM that the NATO-backed overthrow of Moammar Gaddafi has produced little but chaos in Libya got a boost on Monday when gunmen briefly took over Tripoli’s international airport, fired a few shots and grounded the international airliners that only recently had begun to arrive. Less well-reported was the follow-up: The dust-up ended in a few hours without fatalities, and the airport was back in business Tuesday. Such is Libya: a country awash in militias and weapons and almost entirely lacking in institutions that nevertheless appears to be taking a couple of steps toward a new democratic order for every step back. Among the recent steps forward: The interim government registered 90 percent of the country’s eligible voters for what would be the first elections in 60 years; 47 percent of those who signed up were women. Some 4,000 candidates have presented themselves for the election of a 200-member national assembly that will be charged with writing a new constitution, appointing a new interim government and overseeing another election a year from now. Local elections have already been held in the cities of Benghazi and Misrata. In those big cities and in Tripoli, policemen and the regular army keep order, and daily life has mostly returned to normal. So has the engine of the economy: Oil production has reached 90 percent of its prewar level. The government has recovered more than $100 billion in frozen reserves, giving it ample resources for a population of 6 million people. That still leaves plenty of dangers. Militias control parts of the country and hold hundreds of prisoners — alleged accomplices of the Qaddafi regime — in detention centers where human rights groups have documented abuses. Fighting among tribes and between Arab and sub-Saharan peoples has destabilized several southern cities. Al-Qaeda is seeking a foothold, and a militant Islamist militia leader, Abdel Hakim Belhadj, has formed one of the larger of the 140 new political parties. The LA Times article didn't mention this positive stuff going on in Libya because that is not their mission. Anti-interventions turned counter-revolutionaries like John Hankley promote the LA Times take on Libya because they have the same mission.